If you are surprised that someone would take the time to write about so dull a subject as tool storage, you clearly haven’t experienced the wonders of the MONTEZUMA. The Montezuma is the remarkable contraption next to Charlie in the photo at the right. 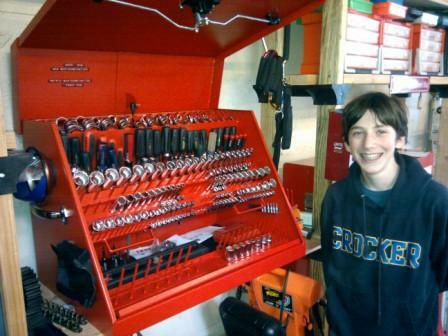 These toolboxes are marvels of clever engineering and design. MontezumaMfg call this monstrosity a “Portable Toolbox”, but trust me–there ain’t nothin’ portable about this bad boy when it’s fully loaded. The one I have is the LARGE size and weighs 87 pounds before you add a single socket. Its capacity exceeded even your author’s ridiculously extensive selection of tools. Today we finished the compression test so we could move on to engine removal and further dis-assembly. First, we backed the car out of the garage to vent the exhaust and ran it for five minutes to warm the engine up. This ensures that the metal parts have properly expanded to create the best possible seal between the cylinder walls and piston rings and recreates the conditions under which the engine normally operates. All checked out OK, with the exception of cylinders 2 and 3. We retested them wet (with a squirt of motor oil) because of the low dry readings, but first we had to run out to buy a working oiler from the nearest Kragen because our was on the fritz. Because the compression readings were fine with oil in the cylinders, we think it could be a piston ring problem. Dad taught me how to use a torque wrench to tighten spark plugs, and explained how easy it is to ruin the threads. Last of all, one of the spark plugs was carbon fouled, so we’ll replace that. Next step: I’ll remove the front fenders and hood so we can steam clean the engine before pulling it and the transmission. Looking forward to our next day! who's the old guy in the picture? where are the photos of you? Yesterday, my dad and I rushed to the garage to practice a compression test on the Mustang before he had to catch a flight for London. After grabbing a sandwich to go from our favorite local cheesesteak shop, we arrived at the garage to find that I left the article about compression testing on the printer. Nevertheless, we quickly found it online on my dad’s phone, as well as an eHow about using a remote starter. We quickly tested the battery after charging it last time, and then attached the remote starter. (Have I mentioned we did everything quickly?) Dad took out the spark plugs and had me photograph them after he measured the gaps. He didn’t have enough time to tell me about the importance of the tip color and gaps, so he recommended I look it up in Auto Fundamentals (a really helpful book by Martin Stockel and Chris Johanson). We only finished dry tests on the first two cylinders, but we’ll have to retest them on our next visit… this was just a practice run in the short time we had today. We’ll have to do it again when we have time to let the engine warm up to operating tempearature first. At least I now understand how to do it for next time. Yesterday, Jack and I were able to squeeze in a very rushed hour at the Three Lions Garage before I dashed home, took a quick shower, dressed and raced to the airport to catch a flight to London. Before I left on my trip, I wanted to spend some time with Jack to cover the basics of Compression testing and work out with him how to attach a remote starter switch to the Mustang (more on that to come from Jack). While on the plane for 11 hours on my flight (for the start of my week-long trip), I started to feel sad about being away for a week and not having time with Jack in the Garage to work on the car. I was experiencing classic withdrawal symptoms. I arrived at Heathrow at 11:00am Sunday morning, took the Heathrow express to Paddington Station and hopped in a black cab (a 1980′s era Fairway) to Picadilly. I felt that same feeling of comfort and security I always feel in a Black Cab. That same feeling that led me to buy one for us in California (although that one is white–a condition I will soon remedy when I return). 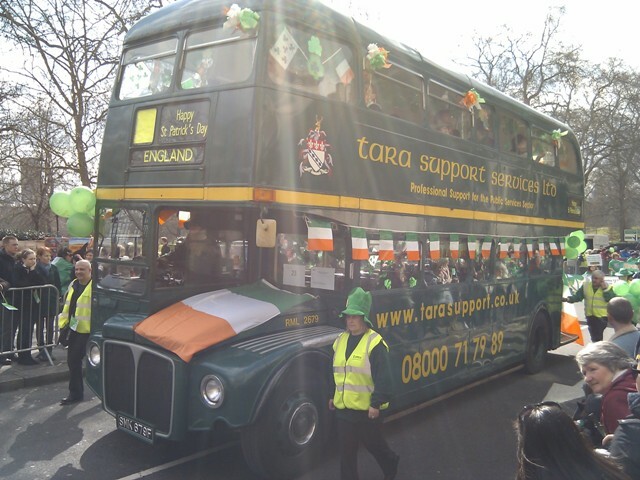 As soon as I told my (lady) cab driver (which one doesn’t see very often in London) my destination, she told me that Picadilly is closed for the St. Patrick’s Day parade but she could get me within 1/2 block of my destination. 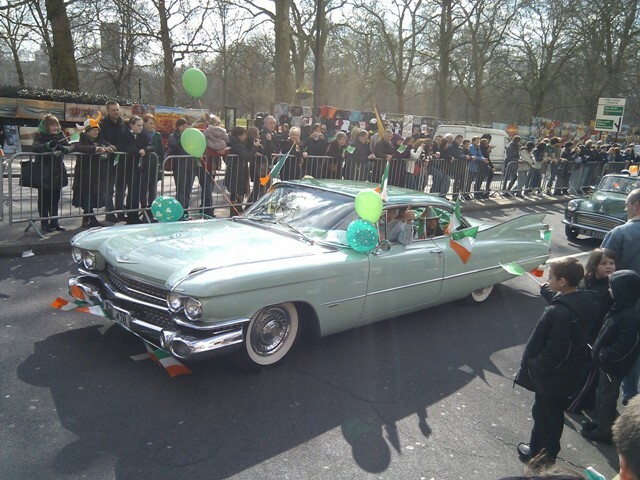 A 1959 Cadillac Eldorado (in two-tone mint green) motoring slowly down Picadilly! I realized at that moment that while I have been pining over post-War European cars since I was a young boy in Los Angeles, there were young english lads who aspired to own American cars of similar vintage. 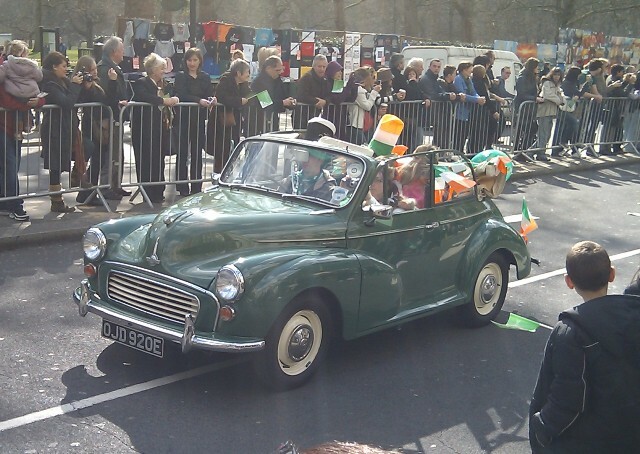 There were a few other cars (all in green St. Patty’s livery) in the parade, but none quite as interesting. Enjoy my photos of the 1955 Morris Minor Series II Tourer, a nice (unusual in green) AEC Routemaster double decker bus and a modern truck I can’t possibly describe any way other than “Fuzzy”. 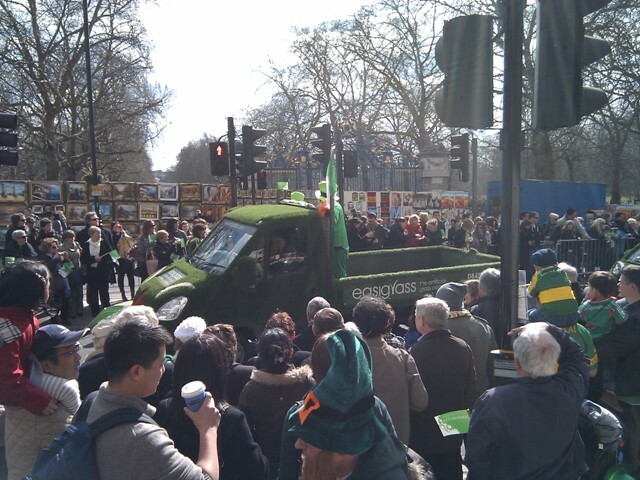 Not Bad, thanks for posting St. Patrick’s parade in Picadilly (continued) | Three Lions Garage! A guy walks into a bar with a pair of jumper cables, the bar tenders says “Alright I’ll serve you, but don’t try to start anything”. You don’t want to be stranded if you have a routine automotive mishap (flat tire, dead battery, etc.). There are a few basic items that everyone on the road should carry in their car. Even if you don’t know how to (or want to) do the work yourself, you may end up waiting three hours for roadside assistance (as I once did waiting for a tow until three a.m. in the middle of San Francisco). Even worse, what if you break down in an area with no cell phone reception? Ask yourself if you really want to be dependent not just on someone you can trust driving by and stopping to assist you, but having someone you can trust who also has the basic emergency tools in his or her car driving by and offering to assist you. Will the National Charity League ladies take us up on our challenge? Last night we ended our car maintenance and emergency procedures clinic (see Order Restored 8 March) with the delightful young ladies from the National Charity League before they had the opportunity to try changing a tire. We did so for a very important reason: they had to hurry home to catch the 82nd Annual Academy Awards show. (Jack and I recorded it so we could “time shift” and start watching it at 8:30 while we inhaled a late dinner). Our friend G (who coordinated the session at the three lions garage) stayed long enough to practice changing her tire (which she did flawlessly). It was interesting to learn in the process that the standard lug wrench supplied with her very cool Mazda 3 (ZOOM ZOOM) was too short for her to apply sufficient leverage to loosen the lug nuts. And I wouldn’t call G a wimp. She is a multi-sport athlete and a terrific skier. The OEM lug wrench was so short that even when she tried jumping up and down on it, she couldn’t get the lug nuts to budge. If it wasn’t for our practice session, she never would have realized it and could very easily have been stranded somewhere as a result. Happily, G learned about the shortcomings (literally) of the OEM lug wrench *BEFORE* an emergency arose in which she was dependent on it. She easily loosened said nuts with the longer lug wrench we gave her. I think she’ll be purchasing a better, aftermarket lug wrench to include in her Automotive Emergency Kit. Then, we threw down the guantlet. We encouraged (OK, we straight-out challenged) the other ladies in her group to try changing a tire in the comfort of their own driveways on a sunny day with a cold (non-alcoholic) drink within reach. Doing so when you’ve removed all the stress-inducing conditions typically present when you are forced to change your tire is the best way to learn. You should first practice a tire change when (1) the weather is optimal, 2) the lighting is good, 3) there is no danger from nearby car traffic and 4) there is no time pressure. Jack and I offered a brand new digital tire gauge to the first young lady to send us photos confirming she has successfully completed a practice tire change session. Will any of these talented young ladies will pick up the gauntlet? Jack and I finished cleaning up the garage just in time for us to host a session on basic car maintenance and emergency procedures for our friend G‘s National Charity League chapter. 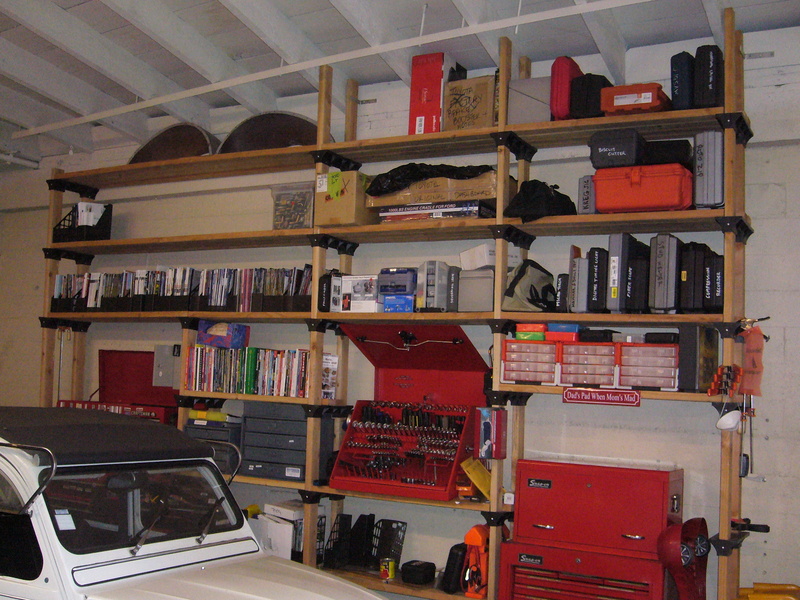 For a “before and after” comparison on our cleaning progress, compare the photo entitled “order restored” (above right) to the shelves in the background of the photo in the trouble with a capital V8 entry below. Our guests and their moms were great sports. G even took the opportunity to practice changing her tire, and she did so very impressively. 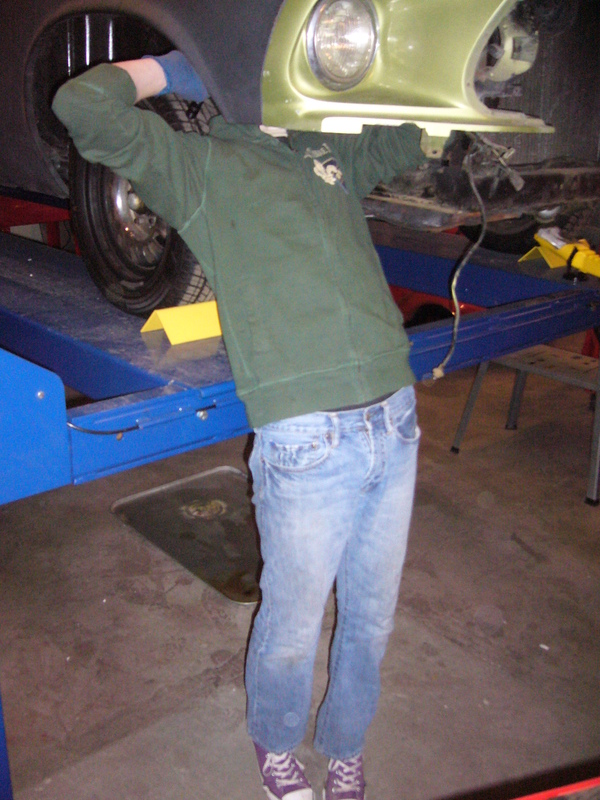 After helping dad clean the garage, Jack managed to squeeze in a few hours of work wrenching on his car. He tested his battery to determine if it’s salvage-able. He will have to re-test the battery after the results showed it needed to be charged before the test would yield good results. Grasshopper also decided to test the conductive properties of dad’s Craftsman 1/2″ chrome combination wrench by bridging the battery terminals. It turns out that the wrench is a great conductor! 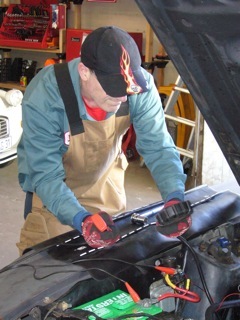 Jack successfully removed both headlight buckets and decided to defer the compression test until next time to learn what condition the engine cylinders and valves are in before he starts to disassemble some of the electrical system components. You are currently browsing the Three Lions Garage archives for March, 2010. 64 mySQL queries in 0.245 seconds.